Louisville started the Bubly Invitational with an sweep of UCF, but it was the nightcap between No. 7 USC and No. 3 Florida that lived up to the hype with the Trojans pulling up the road upset in four sets. Key Stats: Louisville owned the net in the sweep, outdoing the Knights in kills (47-33), hitting percentage (.362 to .133) and blocks (10-4). The Cardinals hit .429 in the opening set and cool off throughout the match, dropping to .387 in Set 2 and .286 in Set 3, but it was more than enough to sew up the win. Stat Leaders: Melanie McHenry (12), Megan Sloan (12) and Jasmine Bennett (10) led the way for the Cardinals offensively. McHenry rounded out a double-double with 10 digs and was one of four UofL players with four blocks in the match. Bennett also posted four stuffs. Molly Sauer was tops on defense with 19 digs, while Kelly O’Neil served up two of the team’s three aces. McKenna Melville and Kristina Fisher were tops among the UCF offense with nine and eight putaways respectively. Fisher hit at a team-best .350 clip (8-1020) and added two blocks and an ace. Nerissa Moravec notched a team-leading three stuffs, while Jordan Pingel posted 12 digs. It Was Over When: A 7-0 run in Set 3 gave the Cardinals a 10-3 advantage, which they would not relinquish. Five different players contributed a kill in the stretch. A Melville putaway stopped UofL briefly, but the Cardinals scored six of the next seven to push the margin to 11 at 16-5. Three points came on UCF errors and two were off the hand off Bennett. Down 18-7, the Knights mounted a comeback with a 7-4 run, narrowing the gap to eight at 22-14. A pair of kills by Wilma Rivera put Louisville on the hill at 24-15. Two errors and a Kathryn Wesolich putaway kept the match going before McHenry issued the final blow at 25-18. Key Stats: USC was the more efficient team offensively downing 52 kills at a .260 clip, while Florida managed 46 putaways but hit just .152 on the night salvaged by a .382 effort in Set 2. The Women of Troy also boasted a 66-50 edge in digs. The rest of the stats were fairly even, with both teams managing seven aces and the Gators holding a slight 8-7 advantage in blocks. Stat Leaders: Brooke Botkin posted a 20-kill, 15-dig double-double to lead the USC charge, while hitting at a .364 clip. Khalia Lanier chimed in with 14 kills and five digs. Raquel Lazaro just missed a double-double with 41 assists, nine digs and three blocks. Jasmine Gross put up a match-leading five blocks and added six kills on a team-best .385 hitting effort. Defensively Victoria Garrick held it down with 19 digs, while Reni Meyer-Whalley added 12 saves. Holly Carlton and rookie Thayer Hall paced the Gators with 16 and 12 putaways respectively. Carlton hit at a .303 clip, but Hall managed just a .060 clip (12-9-50). Rachel Kramer notched six kills and a match-leading six blocks, while Allie Gregory pulled up 17 digs. Macy Phillips accounted for three of the team’s seven aces. 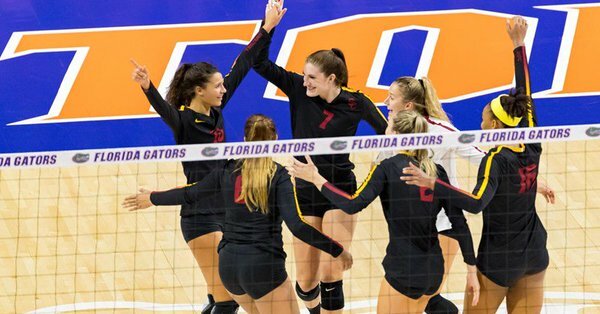 It Was Over When: The Gators scored four of the first six points in Set 4, but USC turned the tables with four straight points, including two Gross kill and two UF miscues. Two Carlton kills made it a two-point game at 8-6, but the Women of Troy pushed the edge to seven with a five-point run, including a Lazaro ace. Florida countered with a 4-0 run of its own, including two stuffs by Marlie Monserez and a Phillips ace to pull within three at 15-12. The teams split the next four points and USC called a timeout leading 17-14. From there, the visitors scored six of the next seven to go up 23-15. Two blocks and a kill by Gross highlighted the run. The set was far from over, however, as Florida rattled off four in a row and tacked on two more to thwart the two USC match-point tries at 24-19. Carlton led the final push with three kills and a block bringing the score to 24-21, but Botkin closed the door with her 20th putaway.